Super Hero Boy: Gimme those booties! I've been drooling over the Isabooties's chocolate dots since I saw them a few months ago and finally we have a pair here to play with. The combination of chocolate ultrasuade and that dotted ribbon across the front is so pretty. They are fairly simple in design, no monkeys, no doggies, no embroidery, just cute designs with simple accents which is especially nice if you want to use them for casual wear but even better if your looking to pair them with a formal outfit. I LOVE my soft soled shoes but I am always frustrated when it comes to formal wear as though I have to admit I'm a sucker for Connors puppy dog shoes, they don't look nearly as nice with "evening attire". Isabooties however look great with everything and that simple little dot ribbon really stands out just peeking out from underneath some gorgeous little baby slacks. Who am I joking it looks great even if its just with a pair of casual shorts or even a diaper. The ribbon embellishments are not what makes Isabooties special. If you have had any past experience with soft soled shoes you'd know that typically the bottoms are made of a soft suede or smooth leather. As they are normally just for indoor use only thats not really an issue but I don't know a single mom who has stuck firmly to that indoor rule. If I am out and about with Connor and he has his soft soled shoes on and we forgot our outdoor shoes I won't deny him a good romp in the grass just because he has his soft soles on, but with that said it does come with some risks. Soft soled shoes are notoriously slippery when wet and especially those smooth leather soles do not offer much traction when it comes to outdoor surfaces, as well they were not designed for them. Though I still do not highly recommend you allow your baby to run all over the place outside in soft soled shoes (especially concrete as that destroys soles) but Isabooties soles are unique as even if they get wet they feature soles made from Touchtek. Toughtek is super durable, very grippy, flexible (just like a smooth leather bottom) and it does not get slick.. ever. Combine that with a scuff proof Ultrasuede top, and you have some pretty rockin shoes. The Ultrasuede also washes incredibly well. I always cry a little when I have to put my soft soled shoes in the washing machine as I know when they come out they will be all crinkled up and it takes a while for them to stretch back and look as good as they did when they went in. Ultrasuede is designed to be washable so you can wash and wear without any worries at all. One more note.. since Isabooties are made of Ultrasuede and Toughtek, that means they are totally "animal free" so those of you trying to stick to a vegan lifestyle can breath a sigh of relief! Isabooties are available directly from their website! The best part is.. one reader will win his or her own pair of Isabooties in their choice of styles/colors/size (of in stock styles)! Leave a comment on this post. Check out Isabooties and tell me which pair/size you would want if you win! Choose wisely as thats what you will get pending whats in stock if you do win! This contest will end August 31th at midnight! I really like Varsity Stripes in 18-24 months! I really, really like the Mille Fleurs, but they aren't stocked in Pea's size. My next favorite are the Candy Dots in 6-12 months. These look like fantastic shoes! Your button is on my sidebar! I really like the Chocolate Dots in 12-18 months! These look so cute and comfy! All the shoes at Isabooties are so cute and comfy looking, it's a hard choice. I'd pick the Slate Blue Sporties in size 6 - 12 months. The Pink Cozy Toesies are our fave. Great sale on those, by the way! Size 3-6 mos. would do nicely for Lily. I like the Cotton Candy ones the best. Chocolate Fleurs in either size 3-6 or 6-12. And they are ADORABLE!!! Thank you for this giveaway. These booties are so adorable. If I won, I'd love the Anchors Away in 12-18 months for my little man. Thanks so much. I am crazy in love with the chocolate dots Isabooties in size 6-12 months. Those are wicked cute! There are so many cute options, but chocolate dots are my faves. I like the Cotton Candy Ballet Criss-Crossers (size 12-18 months). They're so simple and sweet. My baby sister would look adorable in them! thanks for a chance to win them! I really liked the classic Isabooties in Candy Dots - Size 3-6 months! i subscribed to your feed via google reader! Our fave is the Pink Cozy Toesies in 3-6 mos. for Lily. Chocolate Cozy Toesies in size 6-12. I'd like to win the lilac tulip toes in size 12-18 months for my daughter. Thanks and very cute. i like the anchors away 18-24months. My favorite is the chocolate dots features. My second-favorite is the lilac tulip. I would need 6-12 mos. Thanks. Im getting induced tomorrow and I'd love to win the adirondacks in 6-12 months for my son coming! I love that green/brown combo! I love the chocolate dots in 6-12 months. 3-6 months, Pink Tulip Toes please...thanks! Love these shoes!!! My first choice would be the Pink Tulip Toes, and my second choice would be the Cotton Candy.....both in the 12-18 months size. These are great and all so cute. I would like the Hudson in size 12-18 months. Chocolate Cozy Toesies in 3-6 months are precious!!! Sea charms in 6-12 months. So sweet! Love the Anchors Away in 18-24 months. Thanks for the wonderful giveaway! Pink Cozy Toesies in size 3- 6 months. The cotton candy ones are so cute! I love the Sherbet. In size 3-6 months please. I would give these as a gift to a good friend that about to have twins. Too bad you not giving two pair away. I need a boy and girl pair. If I win I just have to buy a pair for the boy. I wish I could save them for me, but were having problems getting pregnant, or when I do get pregnant I lose the baby. Maybe it will work out soon. We almost ready to give up. I like the "Anchors Away" in 3-6 mos! 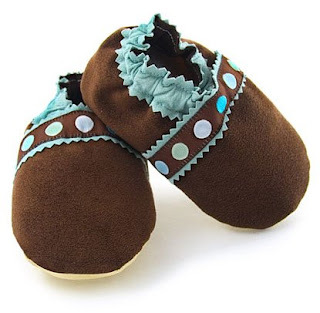 I love the Chocolate Dots, and would love them in a size 12-18 months :) They are all too cute though. I am also a subscriber to your feed. Chocolate Cozy Toesies in 18-24 months, please. The pink cozy toesies in size 18-24months! Wow I'm going to list for our baby girl who's due and for my son Gabriel, so whichever they have in stock from the two! For my son Gabriel Anchors Aways size 18-24 months! Your on our blog sidebar! I like the Hudson style in size 3-6 months! Thanks so much! I would get the candy dots design in size 18-24 months. Cute - I like the sand all arounds in 3-6 mo. Thanks!! 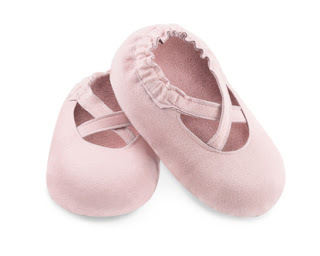 My girl would sport the Ballet Criss Cross shoes in Cotton Candy Pink, size 18-24 months. Chocolate Dots in size 12 -18 mo. I like the Pink Tulip Toes in 12-18 months. They are so cute. I like the Anchors Away in 18-24 mo size. I like the pink cozy toesies in size 12-18 months for my little one! I like the Cotton Candy, 12-18 mos. i like the varsity stripes. The Lilac Tulip Toes in 6-12 months would be my pick!!! Chocolate dots in 18 to 24 months. I'm lovin' the Candy Dots in size 6-12 months. So many great designs to choose from!!! My favorite is Anchors Away n size 12-18 months! These are adorable. My pick is Lilac Tulip Toes in 6-12 months. Thanks. I would pick the Pink Tulip toes in size 6-12 months. I would pick Cotton Candy in size 3-6 months. The Pink Cozy Toesies size 6-12 months are so cute! The Adirondack Trekkers in 6-12 months would be so wonderful! I love the little pink cozy toesies in 6-12 months. How adorable! The Adirondack (sp?) in 12-18. Chocolate Fleurs - 3 to 6 mo. Chocolate Dots - 3 to 6 months.